We are often asked to help promote LEGO Ideas projects and we are happy to do so in our regular Fresh Ideas round-ups. However, every now and again a project comes along that is so cool and original that it justifies an article to itself. Stephan Niks contacted us this week about his Anatomini project and I was immediately blown away by the originality of the idea, the design of the model, its presentation and, unusually, its educational value. It's easy to dismiss many Ideas projects as 'more of the same', 'not a hope in Hell', or 'inappropriate IP' but that's certainly not the case here. 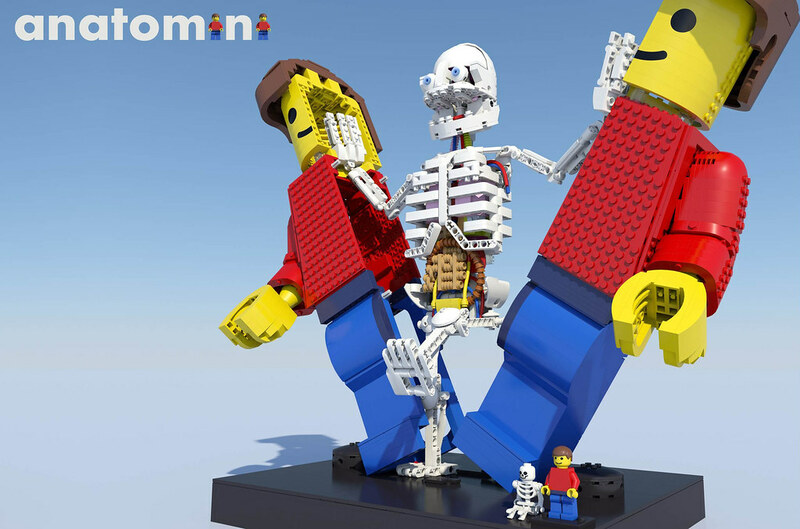 Anatomini is an upscaled hollow minifigure that splits in two to reveal its insides. If that was all it was it would be cool enough. 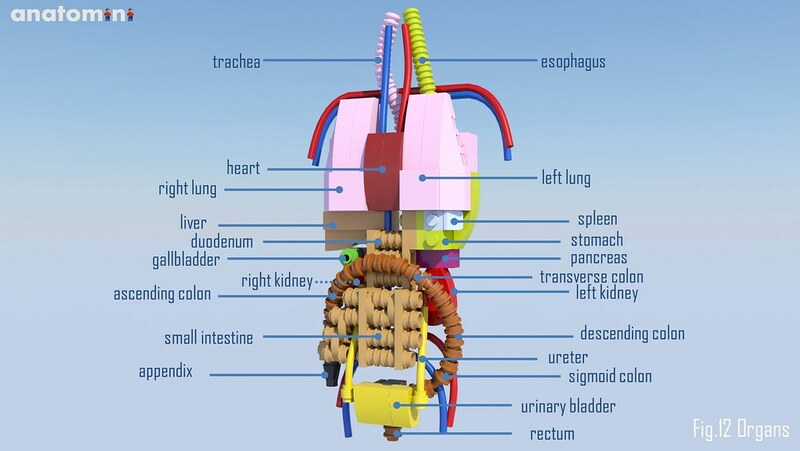 ...and inside of it are the organs, pipes and other 'gruesome' stuff, all in the correct relative positions. So, not only is this a very cool and fun model that's extremely well designed, it's also highly educational. It would provide the perfect means of explaining to kids what's inside their bodies in a way that can easily relate to. The project has 1500 supporters already, which it's achieved in just a few weeks, so it looks as if it's just a matter of time before it reaches 10k. I think there's a fair chance this would pass review. Pledge your support, then let us know if you agree in the comments. Stephan Niks is from Gouda,The Netherlands. He's an engineer and visualisation artist of airports and ports who has an interest in science and engineering. His favourite LEGO themes are: modulars, custom trains, architecture and of course LEGO Ideas. This is indeed an amazing Ideas proposal worth supporting! The only thing which could be improved imho is the "hairpiece", as it looks distinctly odd. It is a great idea and definitely educational. However, something a bit more useful to all Lego fans would be better. (like Fishing Store). Is it true that Brickset members can ask for support/coverage of their projects? What's the point in trying to capture realistic anatomy in something that has none whatsoever? While interesting it's also real dumb. I'm not sure I'd buy it either, but it's always a thrill to see how detailed and realistic Lego creations can be. Very cool idea (although I have the feeling I've seen something like this before). Excellent project from a build point of view and an educational point of view. Would even be nice to see a set like this utilised as a proper educational tool by schools for younger kids who perhaps don't need to see the squishy bits just yet. It's fair to say that this is what Ideas should be all about. The world of "Corporate IP" is all well and good, but submissions like this are the ones that stand out. Recreating your favourite scene from "Walking With The Big Bang Friends" is easy-peasey, but this has taken inspiration, originality and creativity - all in short supply on the Ideas forum! Supported. And if it gets approved, bought! Why is it wearing a syrup? Came across it two weeks or so ago on Ideas and immediately supported it. I hope Anatomini gets 10.000 votes and that it will become available as an actual set. I will definitely buy it. It is so cool and original! I saw it a while back, frankly I don't see it working out. Besides shouldn't it have a minifigure skeleton inside? I would almost rather just one with correct-ish proportions, but this is a great idea and looks cute! I don't see why or how this would ever get made. It's cool to look at, like many Ideas sets, but ultimately I don't think it appeals to a lot of people, and frankly many might find it creepy. The Lego minifigure doesn't lend itself to anatomical models, so trying to make one fit in here is just weird. An easy pass for me. It's awesome but it seems a bit creepy I don't think I'm Gona buy this if it comes into a set! As a nurse, I think that is an awesome Idea, and I. Want. One!!! Love this idea! Hopefully Lego Ideas does as well! Can imagine it would be used in many a classroom as well. This is going to give children nightmares. Wow, amazing model. Examplary of the type of content that I would be expecting of Ideas. This would generate lots of interesting parts! The marketing is excellent as well. I think the whole package fits perfectly in the Lego style. Not sure if the subject matter will make it past review and the piece count/price might be a challenge, but giving it a vote! Totally amazing! I would buy in a flash! The project has my support 100%! I'm sure this guy would suffer many gruesome deaths in the hands of children. Looks really cool! Very original. To answer a question asked by Brickchap right at the start: Rock99rock and myself write Fresh Ideas and Ideas Showcase articles at about monthly intervals. Rock99rock's Fresh Ideas articles tends to focus new Ideas projects while my Ideas Showcase articles looks at any Ideas projects (I tend to skip the new projects and leave them for Rock99rock). Get in touch with one of us if you would like some coverage and promotion of your Ideas project. 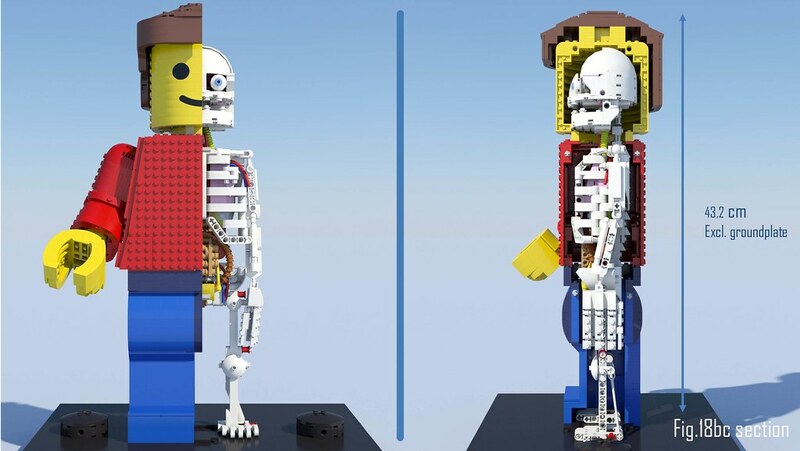 An Interesting idea for Ideas, yet designer Jason Freeny has also created a similar lego mini figure idea/figure with internal skeleton, although it's not from Lego bricks, nevertheless is an original and interesting creation too. I do not understand what about the human body is creepy! I think it is a brilliant design and idea. I'm supporting and purchasing if it gets made. I think this is absolutely phenomenal, the execution of the idea, the interactive nature of the model, and the accuracy are just incredible. This would be an instant purchase, a stunning incredibly well made, original model. Hell yeah, this is awesome! And to the naysayers, not every Ideas submission has to be a modular of some sort. You can stick those in your pants. Have you got something against the modular buildings? I meant Lego Ideas sets that were more useful and had more play value. Fishing Store was a classic System set with new prints, molds, parts colors and minifigures. A great many fans of Lego have their own city displays, and something like this would be no use to them. Saturn V was a display set, like this, but it had a wider audience of fans who would like it. People who just like space or NASA were a potential market and the moon landings are something most people can relate to and they were an important part of human history. But the human body is only really appealing to teachers/parents who want to teach children about the human body and some people who might be interested in the medical field. 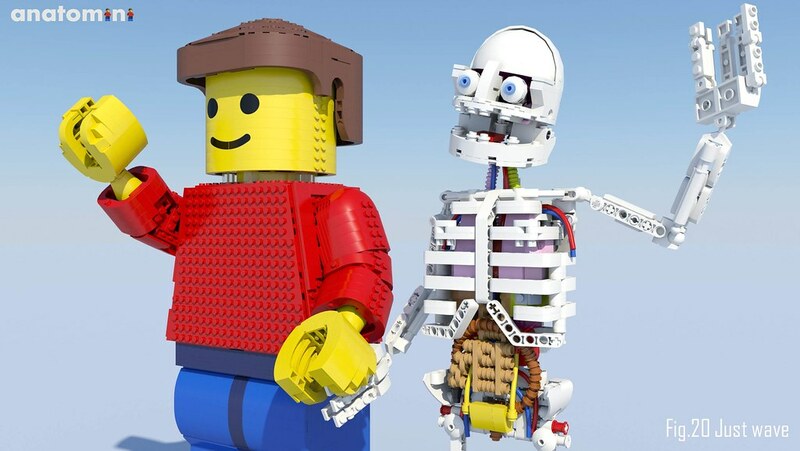 Lots of lego fans would like a large scale, brick-built minifigure, but then they would not need the inside organs. 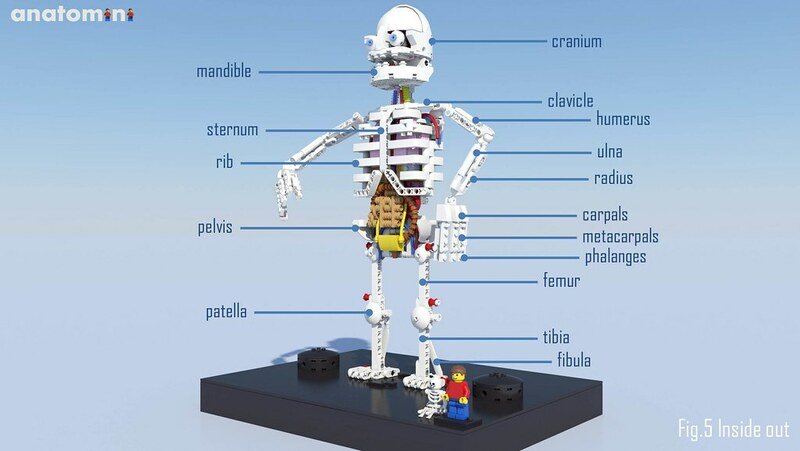 Plus, the anatomy is not that specific to a minifigure (which can be positive or negative) but I imagine a lot of fans would prefer to see what a lego minifigure's anatomy looks like, not a model of the human body in Lego form.